The 20-foot-long installation houses 30 screens measuring roughly eight inches each. The displays are grouped into two sets of 15 (one side for American League teams and the other for the National League), separated in the middle by a large LCD and a consumer-grade webcam. Below the screens you'll notice a plethora of switches with LEDs, info lights and a trio of gauges. Both sides feature three rows of five screens, each pertaining to one of the 30 MLB teams and their stadiums. 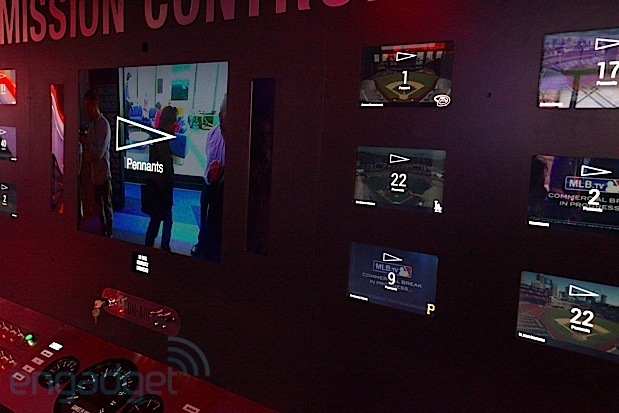 At the flick of a switch, the screens display real-time connected data like recent Foursquare check-ins, weather, Facebook Likes and Instagrams, along with team stats, facts and more for each stadium at once. Those smaller screens, by the way, are actually physically modded Android-tablets -- unfortunately, Breakfast wasn't at liberty to tell us exactly which kind they are. Essentially, they are all running custom apps, with support from MLB.TV to pull real-time, live streams from each stadium in the league. In total, we're told that 13 APIs and seven software languages work in conjunction to make up the Mission Control Center. The setup will also allow players visiting the Cave to have live chats with roughly 10 fans at a time who participate from MLB's site (sort of like Google+) -- of course, the chats allow an essentially unlimited number of spectators. Curious for more of the nitty gritty? Join us past the break. While the shell for the unit is CNC-crafted from wood and aluminum, Breakfast informed us most of the parts it started with were available off the shelf. Thankfully, any pieces that get abused can easily be replaced. The switches have a nice tactile click (something we're told Zolty was obsessively concern with), and change the corresponding LED from red to green when enabled. Speaking of attention to details, each of the 30 tablets is cropped by a wood frame, but the higher levels actually have slightly larger cutouts so that text doesn't get cut off for visitors viewing the displays from below. So, while the screens are slightly cropped, you can't tell thanks to how Breakfast designed the layout of what's on each screen. The larger middle screen is also cropped and split into four separate cutouts. The 4:3 center portion occupies the bulk of the screen for video chats, while a smaller cutout on the bottom acts as your video monitor (like Skype) for anyone chatting from the Control Center. Two cutouts on either side of the screen provide extra illumination, lighting up to a soft white when you stand in front of it thanks to embedded sensors. A backlit on-air section lets you know if you're broadcasting, and there are toggles to mute the video and audio, along with a turnkey for easy recording of chats. To cope with how loud the surrounding area can get, three headsets can be plugged in if the onboard speakers don't prove to be loud enough. 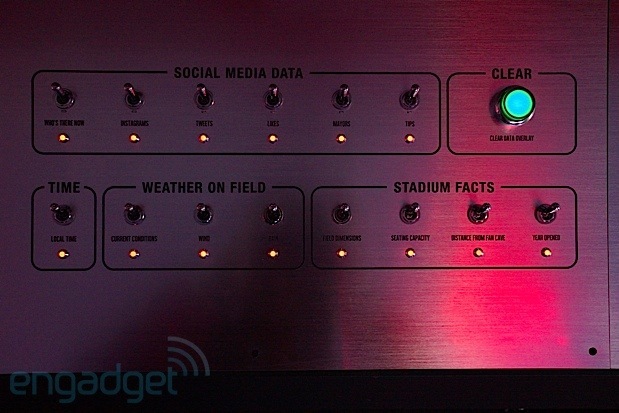 There are six switches for social media data and four for stadium facts. Another three are for weather conditions and one is for the current time at each stadium. Six more are for team stats; four for team facts. Lastly, another four are for team standings. When one is flicked, the middle screen displays a corresponding icon, and the smaller screens begin to display team-specific info -- they spread out from the central display, each making a subtle "bloop" for a nice stereo effect. The three gauges keep track of hits, home runs and games played throughout the season, while the five info lights on each side light up in real time to indicate things like when a game is delayed or when a hit has occurred at any of the stadiums. Aside from all that, a red button relaunches (soft resets) the whole system and sets off a colorful light show as a system check, while another green button can refresh the chat feed if needed. The tablets run over WiFi to grab all the real-time info, which gets populated on- and off-site with the help of MLB's servers. As we're told, four micro-controllers in the unit grab info from those servers and push it out to the tablets, which are essentially slave devices. All in all, this is the craziest thing we've seen from Breakfast yet, and we can't wait to see what's next from the studio. If you'd like more info in the meantime, check out our detailed video walkthrough above, hit the source link below or check it in person if your in NYC. Sports fans and tech enthusiasts alike will find a lot to love. created a unique experience for the MLB Fan Cave in Manhattan. Located at East 4th Street and Broadway, the 20-foot-long control panel and wall harken back to the early days of the space program. Riddled with switches, gauges, and over 30 screens, Mission Control allows you to explore a massive amount of data related to each team, stadium, league and even relevant social data. broadcasts out live from the Fan Cave, allowing visiting players to speak with fans who will be able to join the conversation via http://mlb.com/fancave. The best part is the 30+ toggle switches which fire off the extensive data across all the screens. Trigger "Who's There Now" to get a live update as to who's checked in via Foursquare. Select "Wind Speed" to get the live values right from the field. And of course there are many switches to dive into both live and historical stats on every team. Mission Control is a completely custom project, everything from the skeleton of the wall itself, to the wiring and modification of every hardware and software element was designed and developed from the ground-up by BREAKFAST. It took 7 software languages and 13 APIs to gather and display all the data.